Measuring poverty can be challenging. Rocco Zizzamia and Elwyn Davies reflect on a selection of papers from the CSAE Conference sessions on poverty and inequality and discuss what happens if you stop taking households as units (your calculated GINI coefficient might be off!) and include measures of vulnerability. Many measures of inequality collect consumption data on the household level, ignoring inequalities within the household. This can lead to an underestimation of inequality. Sylvie Lambert (Paris School of Economics), with co-authors, conducted a careful survey of a representative sample of 1728 households in Senegal. Senagalese households tend to be large, on average 8 members. Due to the prevalence of polygamy and married children sometimes staying in the household, households often consist of several sub-units. It turns out that between these households there is quite a degree of heterogeneity in consumption. If we take this inequality into account, the GINI coefficient increases from 54.0% to 56.4%. More strikingly, poverty can occur in households that are overall not poor. In fact, 12.6% of the poor live in non-poor households. Another conceptual issue with poverty measurement is that most measures of poverty implicitly treat poverty as a static phenomenon by measuring poverty at static cross-sections. 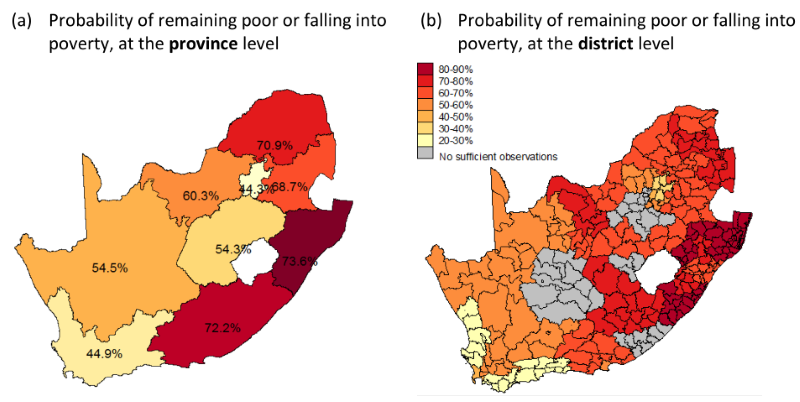 However, as Catherine Porter (with co-author Sering Touray, both at Heriot-Watt University) shows by drawing on two rich survey datasets from Senegal, the poor are not only more deprived in their ability to meet their basic needs in the present, but are also disproportionately exposed to shocks and unable to smooth consumption when these shocks occur. Households in the poorest quintile are 20% more likely to have experienced a shock in the last year than those in the richest quintile, and amongst those who experience the shock, over 50 percent report eating fewer meals, less food and/or lower quality calories. The rural poor in Senegal are disproportionately vulnerable, compared to their urban counterparts – with livestock losses, crop failures, and health shocks being especially prevalent. A further valuable insight is that the type of shock affects the way in which the shock is dealt with. Shocks which affect entire communities (covariate shocks) have the immediate effect of reducing consumption since the value of assets declines universally, compromising the ability of households to sell assets to smooth consumption. On the other hand, shocks which affect individual households (idiosyncratic shocks) are more likely to erode the asset base of those households, since in these cases assets hold their value and can be liquidated to smooth consumption. Drawing strongly on this vulnerability perspective, Simone Schotte (German Institute of Global and Areas Studies) and Rocco Zizzamia (University of Oxford) have developed an innovative approach for defining and measuring social class in developing countries. By linking an analysis of poverty dynamics to social stratification, Schotte and Zizzamia attempt to meaningfully operationalise the notion that social class is determined by “life chances”. 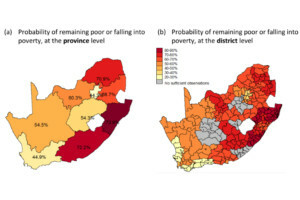 Schotte and Zizzamia’s approach relies on fitting a model of poverty transitions to panel data to predict, based on household characteristics and initial poverty status, the probability that an individual will experience a poverty transition (into or out of poverty). They identify the “middle class” in developing countries as being a class which is not only not-poor, but is also highly likely to maintain a non-poor standard of living over time. Below the middle class they identify a “vulnerable” class, who are non-poor but highly vulnerable to falling into poverty. Schotte and Zizzamia apply this approach to the South African context using nationally representative panel data and find that the economically secure middle class in South Africa is smaller than previous research has suggested, at around 20% of the population. In addition, they find that in a context of a high degree of churning around the poverty line, the distinction between the vulnerable non-poor and those just below the poverty line is less meaningful than the poor / non-poor binary based on a static poverty line implies. The households in the approximately 30% of the population that straddles the poverty line are very similar and swap places frequently. It thus would make little sense to treat these groups separately when targeting anti-poverty policy or interventions to promote inclusive growth. More papers from the CSAE Conference can be found on the conference programme overview. This entry was posted in CSAE Conference and tagged Households, Inequality, OxCSAE2017, Poverty. Bookmark the permalink.